Momma Told Me: Clean the bathroom! It's funny, the things I can relate to; when I receive a product for editorial consideration. Sure, there are only so many things I can say about candles, or another purse- but is it odd that I see bottle of Soft Scrub and am instantly taken back to vivid childhood memories? Sure, cleaning supplies are not the most glamorous of products; but, considering how much I spend on them annually, a valuable aspect of home living, none the less. I learned, at a young age, cleaning supplies was not the area o one's budget to cut corners. Not all brands are created alike, nor as effective as the next. The secret to a valuable cleaning aid? If has to perform multiple functions within one's home. No, I'm not talking about a vacuum that dispenses fresh roast coffee, I'm referring to a cleanser that is touch enough for your harshest stains and buildup, yet gentle enough for multi-room use. A great cleaning brand always has a comprehensive range of products, while still relying on it's original formula for timeless function. After I'd mastered the vacuum, Momma was quick to put me on 'bathroom duty'. If I ever questioned why, without jest, her precise reasoning was, "My mother used to make me clean the bathrooms, and I hated it. Now you get to do it too!" While I'm sure noone enjoys cleaning a bathroom, I particularly despised the chore, myself. The object that garnered the most hatred, however, was the slender white bottle (complete with yellow cap) of original Soft Scrub. Momma's a frugal woman, but she had the sense to know the same formula she had used since 1976 was the absolute best for the job. The unique texture of Original Soft Scrub (with Lemon scent) is what always stood out most in my mind. This white paste (similar to toothpaste) was very gritty, making it tough on the harshest mildew buildup, and stains. Momma just loved making me scrub the grout until it was bright white again! 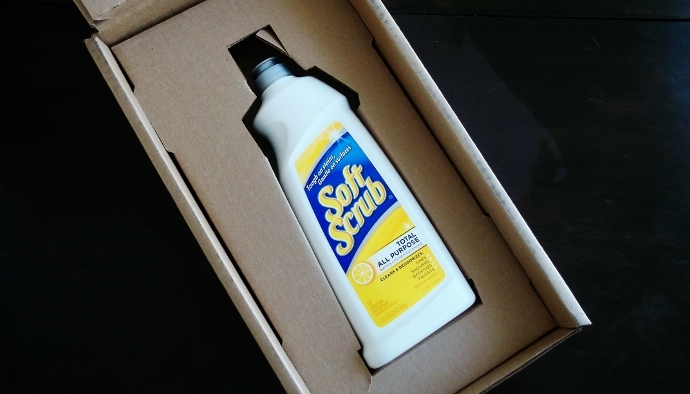 Soft Scrub is also known for being extremely gentle on the surfaces it cleans. Minimizing wear on gentle enamels and protective barriers, while still removing stains and bacteria is a major selling point for the brand. When they recently released a new, foaming, spray version of their product I was happy to put the collection to the test in my own home. 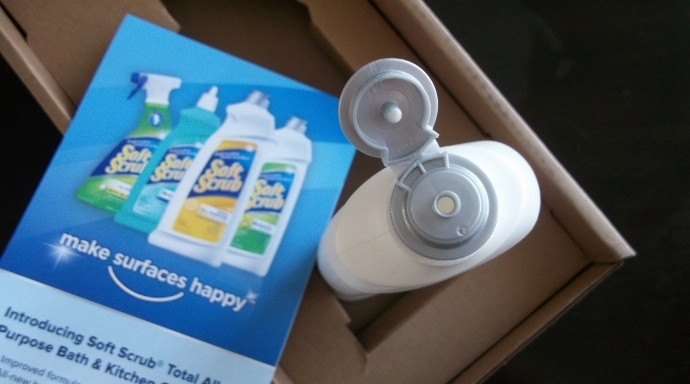 Featuring a modern, revamped, facelift, the bottles offer a stream or foam dispense option and even function upside down for hard to reach nooks and crannies (and even toilets). Soft Scrub Total (All Purpose) is sold in Lemon Scent All Purpose, Fresh Scent Bath and Bowl, and With Bleach. This range is intended to clean multiple surfaces throughout one's home, with the trusted power, yet gentle effects, of classic Soft Scrub. For 2013 the trusted cleansing brand has reformulated their classic formula for extended cleaning power, featuring a new bottle design and cap for easier dispensing. The new product, called Soft Scrub Total All Purpose, is intended to tackle your toughest stains from bathroom to kitchen, and is entirely bleach free. I'll admit, I, personally, rely on Scrubbing Bubbles in my bathroom, where I find the toughest stains and buildup to occur. In all honesty, I have to eat my words- Soft Scrub Total All Purpose exceeded my every expectation. Even without the foaming action of Scrubbing Bubbles, Total All Purpose is just as tough on the water spots and grime that builds in crevices, in most cases working faster than the leading competitor brand. Not only that, but my faucet sparkled after just one application; and the product was so easy to rinse and remove with a basic sponge, no scour pad needed! Soft Scrub Total has taken the 'scrub' out of my chores, and placed all the work on the innovative formula with targeted foam/spray. With the ergonomic design and powerful foaming action, I daresay I would have enjoyed my chores more, as a kid, if this version of Soft Scrub were around! 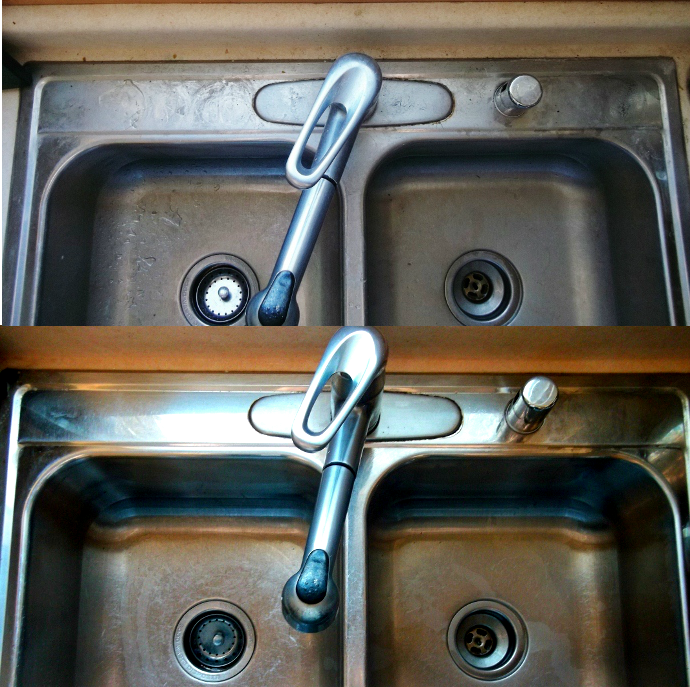 Just look at how my kitchen sink sparkles after a simple rinse down with the new and improved Soft Scrub Total All Purpose formula. This formula is thick, like traditional Soft Scrub, with a Lemon Fresh Scent. It distributes evenly through the wide mouth cap, and is a great example of 'a little goes a long way.' I especially love the light citrus odor, that also aids my garbage disposal as run off clears the sink, and how the stainless steel surface has no residue after rinsing. I've also used this new formula on the bath tub, outdoor patio furniture, and oil stains in the garage, it truly is a versatile 'total' cleansing product! As a Purex Insider I received the new formula to test out in my own home, but you don't need to be an Insider to win your own. To kick off the launch of Soft Scrub Total All Purpose the brand is sponsoring a Sweepstakes where one lucky winner will score $1000 in Soft Scrub products, and 250 runners up will receive a voucher for free Soft Scrub. Hurry on over and make sure you enter the Soft Scrub Sweepstakes daily, per the rules and regulations 1 entry per individual, per day is allowed. Winners will be drawn on March 22, 2013; while you're waiting to hear you've won, be sure to enter our blog giveaway below, where we'll be offering one lucky reader 2 vouchers for free Soft Scrub! What Daughter Says: Cleaning the bathroom, and many other household surfaces, just became a lot easier with the new and improved Soft Scrub Total formula. One Momma Told Me follower will win 2 vouchers for a FREE Soft Scrub product of their choice! Enter our Honey Bunches of Oats (Purex Insiders) giveaway here. Enter to win new Dial Coconut Body Wash here. I haven't used Soft Scrub in years, but I'm eager to try it again! I'd like to try the Soft Scrub with Baking Soda Cleanser. Thanks for the giveaway! I'd like to try the one with bleach. I'd like to try the Soft Scrub w/ Bleach - Mountain Breeze! I'd love to try the Soft Scrub Total Bath & Bowl. I entered the sweeps as well! I would like to try the Soft Scrub Total Cleaner with Bleach. I'd like to try the Soft Scrub with Baking Soda Cleanser. I'd like to try Soft Scrub Lemon Cleanser! I'd like to try the Baking Soda Cleanser!